Home › Crashing › Will You Stop Your Motorcycle in Time? Practicing emergency braking is critical. But, is it enough? Getting your motorcycle stopped in time to avoid a collision is one of the most important skills you can have. But, simply being able to apply maximum brake force isn’t enough (even if you have modern ABS). 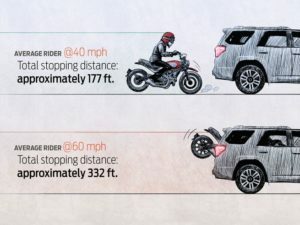 Here is an article I wrote for Motorcyclist Magazine a while back about braking and reaction time that I think deserves some more airtime. Enjoy! You’re riding along minding your own business when suddenly you are facing the bumper of a left turning sedan. Every cell commands you to get the motorcycle stopped ASAP to prevent your early demise. But, will your response be quick enough? It’s a good thing that we are hardwired to respond immediately to threats, but too often our synapses do not fire fast enough for a quick and effective respond. Thankfully, there are ways to help make sure you aren’t a victim of too little, too late. There are actually two components of reaction time: “perception time” and “activation time”. Perception time is the time it takes to figure out what’s going on and decide what action to take. Response time is the time it takes to reach for the brakes. You also have to account for the amount of time it takes to actually get the bike stopped. Let’s say you’re traveling at 40 mph, which is about 59 feet per second. Recent research indicates the average rider will use about 1.5 seconds to recognize the situation and reach max braking rate, also known as perception-response time. That number can increase to over 2 seconds if you’re daydreaming. That equates to between 88 and 117+ feet before any physical action is taken. The actual time it takes to get the motorcycle stopped once the brakes are applied depends on speed, machine geometry/weight, available traction, and your ability to use your brakes fully without skidding (ABS helps in this regard). Recent research also shows that an average rider can only achieve a braking rate of 0.6 g’s. That means from 40 mph you’ll need 89 feet to complete the stop. The 1.5 seconds of perception-response time mentioned earlier adds another 88 feet for a total stopping distance of 177 feet. With perception-response time adding nearly 50% to the total stopping distance, you can see why it’s so important to remain alert. You also want to develop your ability to predict when bad things are about to happen before they unfold. Get ahead of potentially hazardous situations by aggressively scanning for clues that indicate trouble. Be especially vigilant when approaching intersections where most collisions occur. Hard braking when the bike is upright is tricky enough when facing an emergency. But, things get even more challenging when you have to stop quickly while leaned because of a hazard around a corner. Perception, response and braking times still apply, but now you also need more time to free up traction by reducing lean angle so you can brake hard with less chance of traction loss. This necessary action adds to total stopping distance. Machines with Cornering ABS offer a distinct advantage here where you can brake hard while maintaining lean angle. You can reduce activation time by covering the front brake lever and rear brake pedal when approaching potential hot spots. Not only will this simple action reduce activation time, it also puts your whole system on alert. Of course, the best way to reduce braking distances is to slow down. Trimming just 5 mph off your 40 mph travel speed requires about 32 less feet to stop. Add 5 mph and you’ll need about 35 more feet to stop. Speed up to 60 mph and you’re going to need an extra 155 feet to stop, for a total of 332 feet. Yikes. Whether or not you avoid a crash is dependent on your ability to react quickly when an otherwise sublime day suddenly turns into a DEFCON 1 war zone. The best riders remain alert and ready for battle, wasting very little processing time before executing evasive action. They also cover the brakes to reduce activation time when approaching intersections. The final step is to regularly practice emergency braking techniques. 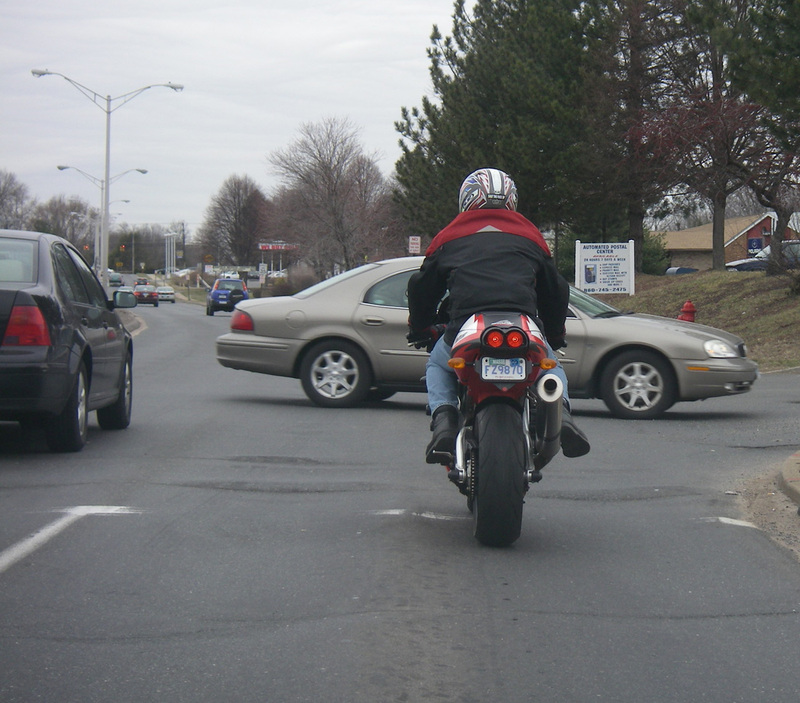 Can you stop your motorcycle in the shortest possible distance while maintaining in control? Too many riders cannot. Read the article at Motorcyclist Online. Thanks to Lou Peck, forensics expert at Axiom Forensics for help in writing this article.